Today, in honor of Mental Health Month, the Colorado Health Foundation released a new Data Spotlight, Mental Health in Colorado: Working to Close the Disparity Gaps. The report highlights key data indicators for Colorado's youth, adult and senior populations that show who is – and who is not – accessing mental health care and why. Lesbian, gay and bisexual Coloradans are two to three times more likely than their heterosexual peers to experience poor mental health. Though there is little difference in the rates of poor mental health by race and ethnicity, blacks and Hispanics fall behind when it comes to receiving help from a professional. Colorado's suicide rate is climbing, with a disproportionate impact on individuals from rural communities and men. 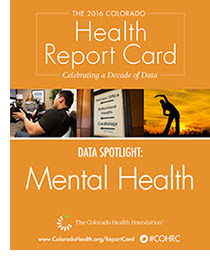 Developed in partnership with the Colorado Health Institute, the Mental Health Data Spotlight is the first in a series of 2016 Colorado Health Report Card deep-dives on pressing health issues impacting Coloradans. Read the full Data Spotlight to learn more about the mental health climate in Colorado and how local and state leaders are taking action on these issues.